RIO DE JANEIRO, BRAZIL – Reclining on the beach with a coconut and a riveting read is for many, the ultimate way to spend a sunny day in Rio. For the English readers among those, finding a good book can be a challenge in the Portuguese speaking cidade maravilhosa, however there is a surprisingly diverse and exciting world of literature available in the city, if you look on the right shelves. Livraria Travessa provides an eclectic selection of new English books, photo by Felicity Clarke. For a clean, contemporary book buying experience complete in store coffee shop, Livraria da Travessa is a great option. 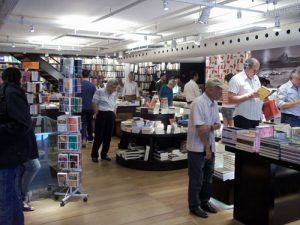 In its stores in Ipanema, Leblon, Barra da Tijuca and Centro, there is a warm browsing atmosphere amongst an eclectic, often intriguing stock that on its English shelf has titles by Hanif Kureishi, T.C. Boyle and Lionel Shriver and includes non fiction books on current issues such as Twitterville: How Businesses Can Thrive in the New Global Neighborhoods by Shel Israel and Paul Roberts’ The End of Food. It’s also worth looking throughout the store as specialized subject books in English are also stocked, in particular art and design. Prices start from around R$10 with an average paperback fiction costing about R$30. Another option for fresh-off-the-press uncreased spines is national bookstore and entertainment chain Saraiva. In their multi channel, somewhat manic megastores you can find a good selection of popular English fiction titles including classic literature and recent bestsellers by authors such as Michael Crichton, John Grisham and Sophie Kinsella in the section titled Pocket Books. There are also imported U.S. magazines including The Economist, Newsweek, InStyle and Elle. There are branches all over the city including Centro, Tijuca, Botafogo and Copacabana. If you like your books classic, hardback and well thumbed by a trail of readers gone by, Livraria Rio Antigo on Rua do Rosário in Centro is an absolute must. 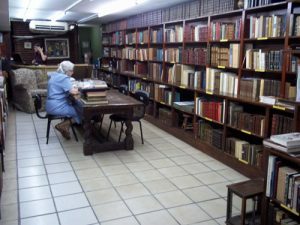 Specializing in antique and rare editions, the 75 year old bookstore is a quiet haven of beautiful books with a history. The English language shelves on the second floor house novels and volumes by classic writers such as Dickens, Wordsworth and Orwell, non-fiction books by thinkers including Jung and Nietsche and unusual titles such as The Story of Sweden by Stewart Oakley and The Perfumed Garden of Cheikh Nefzaoui: A Manual of Arabian Erotology by Sir Richard Francis Burton. Prices here range from R$2 for slim paperbacks to R$150 for special illustrated volumes but the average reading book comes between R$2 and R$15. They also hold book auctions of rare editions of books in different languages, the next of which will be Saturday November 6th. Also worth to mention is Livraria Leonardo da Vinci at the basement of Edifício Marques do Herval on Av. Rio Branco, this store has been serving Rio with books in several languages, including English, since 1952. Centro's Livraria Rio Antigo stocks an exciting selection of English classics, photo by Felicity Clarke. For a potentially satisfying rummage experience there are a cluster of second hand bookstores where it’s possible to find hidden English language gems in the streets between Praça São Sebastião and Praça Tiradentes in Centro. Plus the itinerant Book Fair that pops up around the city at a different locale every month, currently in Largo de Machado, is a good place to find a bargain used or new book in English. Facilitating a friendly sharing of the written word in English amongst the expat community, the American Society of Rio de Janeiro has a book swap service at its events with a variety of genres and titles available to swap or buy for a nominal price. They also have plans to extend this to a magazine swap with popular imported publications from the last six months. For a traditional lending library with a wealth of English material, the library at Ibeu language school on Avenida Nossa Senhora de Copacabana is open to the public and contains over 20,000 items including books, DVDs, audiobooks and magazines. So while at first the hunt for that new beach read in your native tongue may seem frustrating in Rio, be assured there are comprehensive treasure troves and literary adventures out there in the city to suit all tastes. Thanks for this informative piece! I’m constantly looking for books in English and I’m happy to have this article to reference. Maybe the Rio Times could even add a book swap section to their classified listings! As another more informal option, I’d like to add that I have had success with swapping books with various hostels when friends are staying there, in town for a visit. Used English language books are also available at the International Club of Rio de Janeiro’s (InC’s) General Meetings, and at Christ Church in Botofogo. most of the bookstores cited also have books in french, spanish, german and italian. several of the ‘sebos’ (second hand bookstores) downtown now double as bars and cafés, check out Al Farabi at the foot of Rua do Rosário and Café do Bom, Cachaça da Boa at Rua da Carioca 10.